The NeweggBusiness Price Alert feature lets you opt-in to receive automatic e-mail notifications when an item you are interested in is available at the price you want. Price alerts will be sent to the e-mail address linked to your NeweggBusiness account. Note: You will only receive notifications about the item you have chosen to receive e-mails about and not for any others. Once set, a Price Alert will automatically notify you when the item meets or falls below your target price. A Price Alert will remain active until cancelled, but a notification e-mail will be sent once. You can check on the status and modify your Price Alerts from the Product Price Alerts page. Pending The alert is active but the item has not yet reached your target price, but you will receive an e-mail notification once it does. Alerted An e-mail notification has already been sent on the date indicated under the alert status. You will no longer receive Price Alert e-mails for this item even if the notification price is reached. Please keep in mind that price alert e-mails may sometimes be filtered by your spam filter and you may have to add info@neweggbusiness.com to your safe senders list. Price alerts can only be created for select products sold by NeweggBusiness. They cannot be created for products sold by Marketplace Sellers. Please note that you must be logged on to create a price alert. 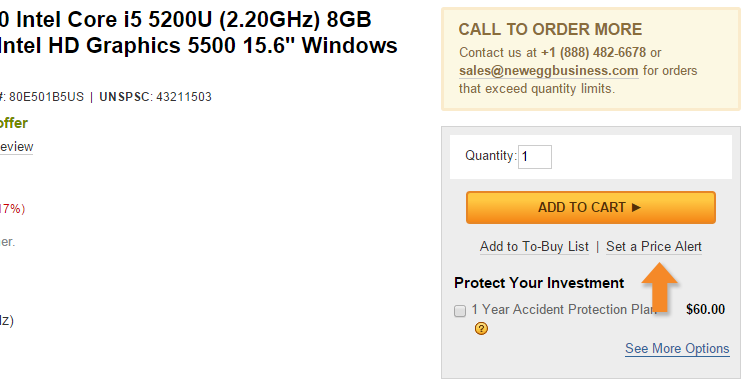 Navigate to the product page for the item you want to create a price alert for and click Set a Price Alert. On the “Set a Price Alert” page, enter the price at which you wish to be notified in the My Alert Price field. Click Submit to create the alert. Once you’ve created a Price Alert, you can modify the target price at which you would like to be notified. Please note: You must be logged on to update a Price Alert. Go to your My Account page by clicking the button on the top right. Click Product Price Alerts in the “Shopping Tools” section on your My Account page. Enter the new target price at which you wish to receive a Price Alert notification. Click Update to set the new price. You can remove a Price Alert at any time, whether it has triggered a notification or not. Please note: You must be logged on to update a Price Alert. Click Remove to cancel the Price Alert.